The version of Nokia’s Share Online application that shipped with my E71 has a problem. I was trying to upload photos from Berlin over O2 Germany’s data network to my Flickr account, and it unexpectedly returned an authentication error; I looked at “your recent photos and videos”, and got photos belonging to Flickr user mrspin, then from three others. Actually, I get another user every time. I could reach my Flickr page via the web browser. The problem is not O2.de or roaming-specific; it happens here in the UK as well. What I think is happening is something like this: 3UK is using a lot of NAT in its data network, as mobile operators often do, and something about Share Online doesn’t handle this well. Specifically, I reckon it’s using the device IPv4 address as part of an identifier – as the addresses in 3UK’s netblock are rapidly being reused for other users, it may be possible for someone else to log in using IP address x.x.x.x, and then a request from me to be bound to the wrong account. Oddly, the browser isn’t affected. I suspect, therefore, that Share Online is doing some sort of weird magic rather than just using the DNS and Flickr’s own authentication mechanism – perhaps it doesn’t resolve flickr.com every time, or honour the Flickr cookie correctly? After all, a Web authentication mechanism should cope with the same user logging in from multiple IP addresses. That should be obvious. Fortunately, when I tried to write to the account, the authentication failed – as it should do, as I was trying to log in to the wrong account. This suggests that Share Online doesn’t actually resolve flickr.com/yourname for read-only, but instead caches replies matched with IP addresses somewhere in the network. As mobile operators reuse IP addresses a lot, and use non-routable (RFC-1918) addresses which aren’t globally unique a lot inside their networks, this is a really bad idea. Something is obviously cached, as the problem persists from my own WLAN as well. I suspect that this used to work because the percentage of a typical operator’s IP address space that was actually used was low, and therefore there was a good chance that the same address wouldn’t be used for the same application before the cache expired. Now this is no longer true. There appears to be a new version of the application out, so will try and let you know. I don’t yet know if I can, for example, see content marked as “private” from other users, or of course if they can see mine. OK, so the Dubai assassination team made regular phone calls on GSM devices during the operation. What numbers did they call? From which ones? Well, it looks like they both used prepaid SIM cards acquired in Austria and they called Austrian telephone numbers. Obviously, that’s partly explained by the fact that they probably talked among themselves, but the only reason to say that they called numbers in Austria would be that there were other numbers called, outside the group. Strange. The Mumbai raiders’ <a href="telephony used both a virtual number service in the US, and DID numbers registered in Austria and pointing at a VoIP system. This could just be an artefact of a data set of two, of course, or that somebody’s Web shop is close to the top of the Google results. PS, does anyone have recommendations for a good graphics/visualisation solution? I’m thinking of doing my own one of these. Specifically, I’ve not seen one yet that takes account of the time factor – there is one suspect who spent only 3 hours 40 minutes in Dubai. Well, this is unusual; Londonstani confirms that the Pakistanis just arrested 50% of the Taliban high command, in so far as such a thing matters. Not only that, they’re willing to extradite one of them to Afghanistan. First of all, Pakistan and Afghanistan even talking is rare. Secondly, extradite? What is this, Germany? Don’t they know they’re meant to administer a medically unnecessary enema and ship the guy to the Kerguelens or somewhere where they can lock him in a dungeon for the next ten years? I don’t think I’ve seen anyone link this story with this one of Laura Rozen’s; at the same time, the Iranians have caught the leader of the Baluch rebels in the south-east, down where the Pakistani border would be if there was any border to speak of. The Iranians are playing it up as a “captured CIA agent” story, but according to Laura’s sources (and frankly, if you’d read nobody else on diplomatic stories in the Bush years you’d be in the top 5% of the information distribution) the Pakistanis and possibly the US forces in Afghanistan were cooperating with the Iranians. It certainly looks like some kind of sudden outbreak of regional cooperation, in a sort of tacit agreement to jointly attack each others’ rebels. Someone smarter than me would probably point out that this is natural – it’s the difference between being a state and not being a state. Could the reason have something to do with this? The first talks between India and Pakistan at foreign minister level for a while. It seems to have gone reasonably well; in the light of the Kayani doctrine speech, in which the General said that Pakistan would be satisfied if Afghanistan wasn’t explicitly aligned with India, as opposed to being run by the Taliban as satraps for Pakistan, you might wonder if there’s a bigger deal afoot. If India agrees not to claim a sphere of influence in Afghanistan, Pakistan might be willing to lock up the Quetta shura as a sign of good faith, and then…perhaps they might get a payoff in concessions on Kashmir, and/or trade with India and with the wider world. How that interlocks with the Iranians is not quite clear, but it would fit with the Pakistanis getting sufficient assurances from the other regional powers for them to crank down the degree to which their various half-rebels, half-proxies cause trouble. So, what does an Iranian dissident need from outside the country? One of those integrated lawful-intercept management systems from a major European vendor (nice, aren’t they)? A barrage of cruise missiles? A lot of hot air from the President? Why not ask one? Here’s the exiled co-founder of the Revolutionary Guard. I hope that the Obama administration and other democratic countries will be more supportive of the struggle of the people of Iran for democracy and human rights. I can summarize it in four items. First, sanctions against the Revolutionary Guard. Second, technical support like satellite Internet for Iran and pressure on companies like Nokia which have sold devices to control SMS, cell phones, and Internet in Iran. Third, help asylum seekers. Some of the activists, journalists and freedom seekers are now out of Iran in Turkey, Iraq, or Dubai. We need to help to bring them to Western countries. The last one is, please everybody, help to prevent any military strike against Iran, especially from Israel, because it would be a gift for this regime. We believe that this regime will be overthrown by the people, and a military strike would be the only solution for this regime to save the government. The organization of the movement is a decentralized social, political network in Iran. Our slogan is “every soldier is a leader and every leader is a soldier,” and that has worked so far. You might also read the Renesys blog on Iran’s international Internet connectivity. OK, so the Guardian spent last week having a great fit of very seriousness* about the UEA Climate Research Unit e-mail leak. Things that weren’t Serious enough to get into the paper included the decisive refutation of the whole idea that the urban heat island effect explains warming and the exoneration of Michael Mann. Here are some other pieces of climate-related news that failed the Seriousness test. Eli Rabett‘s comments thread discovered that the FOIA requests involved were created by Steve McIntyre’s supporters as part of a deliberate spam campaign; they came up with a question that they could re-ask for every state and territory in the world, starting with Afghanistan and working through Wallis and Futuna Island. They could have issued a single request for “any confidentiality agreements signed with any state or territory” – instead they generated over a hundred, and unwisely discussed the standard template they used on the web. It’s an attack so obvious that the Freedom of Information Act itself foresees it; one of the grounds on which you can turn down a request is if it comes as part of a “vexatious” campaign. Yer man McIntyre does seem to like slightly clunky denial-of-service attacks. The words are the very first to appear in the “manual” of climate denialism written by the journalist and arch-sceptic Christopher Booker. They get more than a 100,000 hits on Google, and are wheeled out almost every time a climate sceptic has a point to make, the last occasion being in a Sunday newspaper article last weekend written by the social anthropologist and climate sceptic Benny Peiser. The trouble is, Sir John Houghton has never said what he is quoted as saying. The words do not appear in his own book on global warming, first published in 1994, despite statements to the contrary. Mind you, the Indy still lets Lawsons Dominic and Nigel babble away in its pages. You can’t have everything. *Does anyone know where the very first use of Very Serious Person might be? So, here goes with the first in my series of posts on the strategic defence review as a blog. The National Security Strategy sets out the key threats to the UK’s security and the underlying drivers of those threats. It makes clear that while there is no external direct threat to the territorial integrity of the UK, there are a variety of evolving threats for which we must be prepared, and different environments and domains in which we must be prepared to act, from counter-terrorism and counter-insurgency to maritime security, cyber warfare and capacity-building in fragile states. We believe five major trends will impact on the international context for defence in the coming decades. The rise of the Asia-Pacific region as a centre of global economic and political power will create a major global shift as dramatic as the end of the Cold War. Continuing globalisation will make the world ever more open and interlinked in communication, trade, culture and transport, and we must ensure that those lines of communication remain open if the UK is to prosper. We will see serious climate change, whose impact is likely to be most severe where it coincides with other stresses such as poverty, demographic growth and resource shortages. We are likely to see growing inequality in many parts of the world, as economic development creates new divisions within and between countries. Proliferation will remain a cause for concern. Several states continue to pursue nuclear programmes in contrevention of their NPT commitments. Terrorists will continue to seek to exploit nonconventional means including chemical, biological, radiological and nuclear materials, with wider access to advanced technologies increasing the risks. The UK economy relies on trade and the free passage of goods and services. A stable international order is essential to our interests and security. In the medium-term, success in Afghanistan is critical to UK security. The next decades will see the development of a number of major trends, including a shift of power to the Asia-Pacific region and climate change. Of course, anyone who relies on an executive summary deserves to be executed, but it is far from clear to me that the second point (success in Afghanistan) follows from the first or leads to the second, however you define “success”. It’s certainly a major alliance commitment, but its criticality to UK security is debatable, especially in the light of trade, international order, or the rise of Asian powers. Similarly, there’s a sort of reiteration of standard War on Terror tropes – we’re asked to be very worried about terrorists getting hold of weapons of mass destruction. Going through that little list of horrors under trends, there’s an interesting point that is missing. The rise of new world powers is not a matter of debate, but what about the corollary? Arguably, the UK and France remain medium powers; but the big change is surely that the status of the US as sole superpower is on the way out. It’s not yet clear how much of this change is accounted for by Chinese or Indian success and how much by American decline, in so far as “decline” is a useful concept, nor how fast and how far it will go. But that it exists is indeniable. Surely “Coping with US relative decline” ought to be high on the UK’s political to-do list? International partnerships will remain essential to our security, both membership of multilateral organisations – like NATO, the EU and the UN – and bilateral relationships, especially with the US….Within this multilateral framework, the UK has a range of close bilateral security and defence relationships. None is more important than that with the United States. The relationship is based on common values and interests which will endure in the 21st century, to our mutual benefit. The UK benefits greatly from bilateral co-operation in the nuclear, intelligence, science, technology and equipment fields. Our relationship also increases our impact on issues such as terrorism, proliferation and transnational crime that affect our security but over which in today’s globalised world our national influence is limited. As anyone who reads this blog will probably know, I reckon several of those points should carry the Wikipedian tag “citation needed”. A major theme of Chapter 1 is the importance of multilateralism and international institutions, not just the formal ones like the EU, UN, and NATO, but also informal international institutions like maritime trade and telecoms interconnection. This is not new in British politics – up to a point it’s an implementation of the so-called international society approach associated with thinkers like Hedley Bull and Martin Wight. But a key problem here is what happens if the bilateral special relationship and the multilateral institutions conflict. Since the second world war, it’s been a central assumption of policy that there is no conflict – the US is supportive of the institutions, it benefits from them, and therefore there is no problem. Relax this constraint, however, and the compass starts to spin crazily. What if the US wants to tear up the UN Charter, split NATO, commit a gaggle of war crimes? And we have to relax the constraint – not only do we have the example of Iraq, but we admit that the role of the US is itself changing and its relative power declining. The answer is surely that a major aim of policy is to maximise our ability to say “no”. Otherwise, either the institutions themselves break down or get used to drag at least some of the members along. Looking at Iraq, it’s worth remembering that it’s not enough to be small and pro-European; the Netherlands, Spain, and Italy all ended up contributing significant numbers of troops, but hardly enough to give them any meaningful influence over the Americans. (Hey, a full armoured division and most of the RAF wasn’t.) Alternative scenarios include the creation of new multilateral institutions (that we might not like), a revived UN based on a balance-of-power settlement, or a pre-1914 scenario with five or so similarly sized world powers competing. It will be harder to predict which threats will emerge as the most significant, leading to a future international context characterised by uncertainty. We will need to establish a better balance between operational output and supporting activity and between the quality and quantity of our major platforms. To put it another way: enough with the cost overruns, and projects that spend £192m on PowerPoint presentations. This, of course, is much easier said than done and heavily reliant on the kind of people the MoD recruits to run its procurement operation. “We can’t go on like this” was all about style and look-and-feel; the tombstone seems to be a reaction against it and a reversion to a fairly crude, tabloid approach. Perhaps it reflects discord among the people who commissioned it? It would be easy to identify the first with Steve Hilton and the second with Andy Coulson’s influence, but this is perhaps too easy. 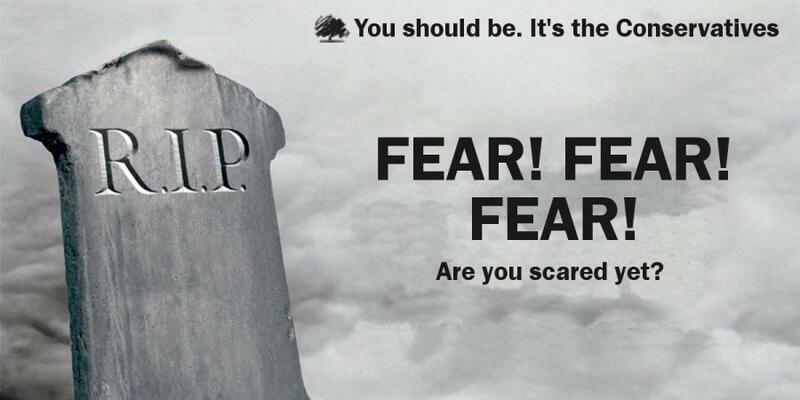 Certainly, the tombstone’s visual language is nowhere near as sophisticated as the Cameron poster – rather than the careful sequential progress from Cameron’s face in the optimal zone of attention to the final sales pitch, the reader’s eye is first drawn to the tombstone (which in a sense stands in for the face), presenting them with a totally decontextualised piece of policy argument (the clip-art stone and R.I.P OFF could be a Mike’s Carpets ad – what’s a rip off? why is there a tombstone here? ), proceeding to the rant, and then leaving you with nothing much. The mention of the Conservative Party, which is the finale and the call to action, is stuffed up in the top right, off the main line of the plot and in a place you usually put visual elements to get them out of the way. Nobody puts a newspaper headline or masthead in the top right hand corner of the page; computer user-interface designers usually put things like logout links or “close window” buttons there so you don’t accidentally click them. Not surprisingly, I felt the parody versions to be slightly unsatisfying compared to the Cameron poster, and at least going by traffic, the Internet public felt the same. The Cameron poster was a classic – a high-style product of the visual language of the corporate and governmental elite, as carefully designed as anything Apple or Porsche produce. It just begged to be subverted. Well, what can we say about this? First of all, there’s the block colour – an entirely black backdrop. 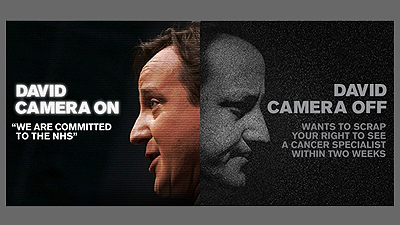 Obviously this connotes seriousness, but more importantly, it signals a very different approach compared to the colour-of-nothing in the first Cameron poster. Rather than trying to avoid our conscious attention, it demands the foreground. 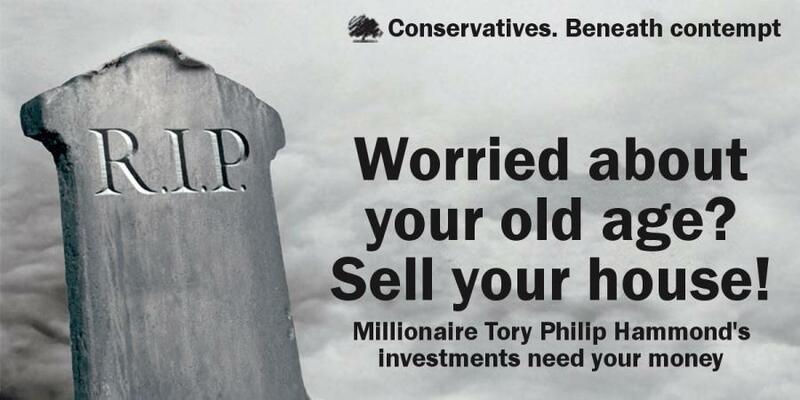 Secondly, it’s much more complicated than either Tory poster. For a start, it includes a joke; R.I.P OFF barely counts. David Camera On is actually funny, at least in part because it’s unavoidable – it hits exactly the image and persona he’s spent so much effort cultivating. If you put yourself on a poster like the Cameron one, there’s no way you can dodge this. A joke implies plot – the set up, then the punchline. 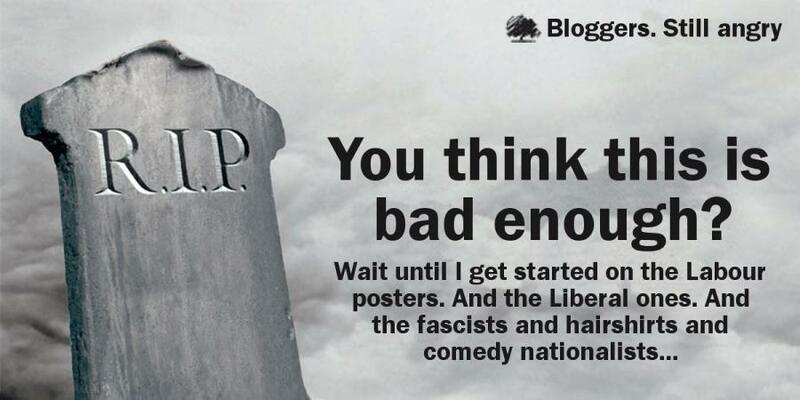 The viewer is being invited to look for the punchline, indeed to come up with one themselves, and the organisation of the poster with its not-quite symmetrical halves leads us to it. The highlighting of the text on the left also plays a role in this, as well as acting as a sight gag about the camera. Also, the well-lit Dave on the left, close to the optimal attention zone, acts as a beacon for the whole thing (rather like he does for the Cameron poster). The arresting image is there, however, to feed us into the joke. Framing a face emerging from darkness in the movies usually means we’re meant to pay close attention to what the actor is about to say. Probably it’s a secret of some sort – we’re becoming complicit in the plot. The function of the joke is to set us up for the policy message directly below it. You’ll observe that this makes considerably greater demands on the viewer than either Tory effort. And it insists that the viewer takes part in the drama. This may be why the designers felt they could do without an explicit call for action – laughing at David Cameron is, after all, a political act. How would we go about mocking this? 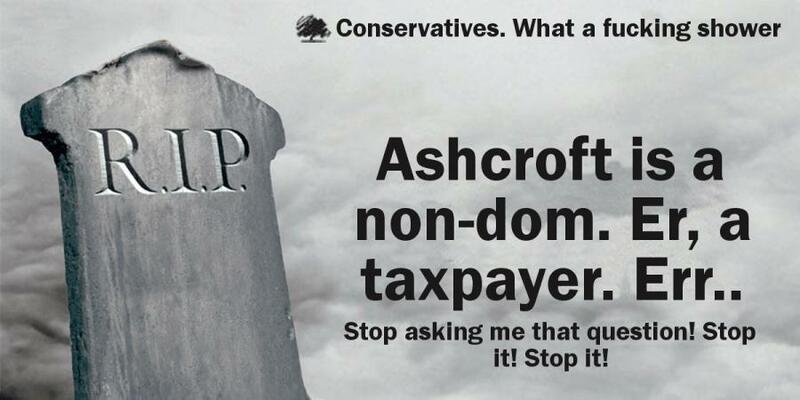 It strikes me as more difficult than either Tory poster. A joke, after all, is hard to alter fundamentally without breaking something. The plot is considerably more complex. No doubt you could replace the central image, but you’re unlikely to find a photo of Brown looking as orange as left-hand Cameron anywhere. The best solution I can think of is to repurpose it as a generally nihilist one – Camera On. Camera Off. They’re all at it. Rub their noses in it on May 2nd. Or perhaps: Camera On. Camera Off. Who cares? We’re all on CCTV anyway. I think he is frit! As this blog battles parochialism, I feel obliged to tell the world that Keighley Cougars have started their doomed bid to stay in the Northern Rail Division One by beating Whitehaven 17-16. Can we win by a cheeky dropgoal? Yes. We. Can! Never mind, the future’s uncertain and the end is always near. Which at least explains Leeds losing to Castleford. The Ministry of Defence has published its strategic review Green Paper online as a WordPress blog for public comment. I will, of course….eh? The MOD just published a major policy paper as a weblog for anyone to scrawl on? The British Ministry of Defence? Things must be bad. I snark, of course. I should, of course, provide here a fully reasoned submission to the process, but I haven’t written it yet. Chiefly, I haven’t written anything yet because I haven’t read the bloody thing, and in a rare blogging departure, I’ve decided to read it before ranting. Instead, I’m going to read it chapter by chapter and comment as a series here. Don’t be surprised if the posts get crossposted to Fistful of Euros. Here are some things I’d like to bear in mind: Kings of War on the cognitive challenge of strategy (are we in the midst of a bout of planning for the last war?). Pass the port – how everyone knew Iraq was a really bad idea but nobody did anything. KOW credited! The Kayani doctrine and planning for a post-American Afghanistan. The ambiguities of information security. JQM mentions that it’s being rumoured that deeper UK-French cooperation might involve the nuclear deterrent. Patrick Mercer out of his depth again. 4th Generation fighter pricing. Putting pressure on EUTELSAT via the French shipbuilding industry. Cooking up the right answer.